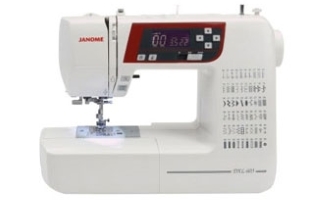 With built-in stitches for quilting & heirloom, as well as general sewing, this is an excellent all round machine. Stitch selections and settings are so easy on the large information LCD screen. Fully computerised, with a wide range of stitch oprtions, yet still light enough to carry to classes .. it’s a full size machine but less than 6kg. The maximum speed controller allows for precision sewing whilst the auto needle threader and the auto 1-step buttonhole make sewing simple. There a needle up/down facility .. great for pivoting on corners and an auto-lock stitch for a perfect end to stitching. It also has a start/stop button which means the machine can be used without the foot control.